I actually bought this arbor a few years ago from the Shop Smith site. It is not easy to find, and the Shop Smith support staff doesn’t exactly trumpet its existence. The arbor attaches itself to the shaft of the headstock on one end, giving you a 5/8″ spindle to attach a standard-style 10″ blade. The advantage is you aren’t locked into the three offerings of Shop Smith Blades at a price range of $55 – $80 as well as the shipping time to get them to you. Another benefit is you can take advantage of new innovations the rest of the market features that are often at lower cost. Plus, if you’d like to go the other way and purchase something like Freud’s 90-tooth flawless finish blades to do finer detail work, this arbor makes it possible by making the whole machine a great deal more flexible. It took 3 years before I needed the arbor, but as I now have a small collection of blades I’d like to use for different specialized purposes, it helps to have the ability to do it with the machine I’ve already invested time and cash into. Also, I still need to rip a crap-ton of hardwood, and I feel better about dulling a $20 blade over a $50 one. A special size arbor? I really don’t get the interest in Shopsmith stuff. IMO their success is due to two things. 1. A hobbyist need for their tools to take up as little space as possible in the garage. Stuff like this is the main reason I never bought into ShopSmith. They make a decent hobby level product but they then get you locked in for all their add-ons. Most folks have no idea you can get 3rd party blades wot work on their Tablesaw. 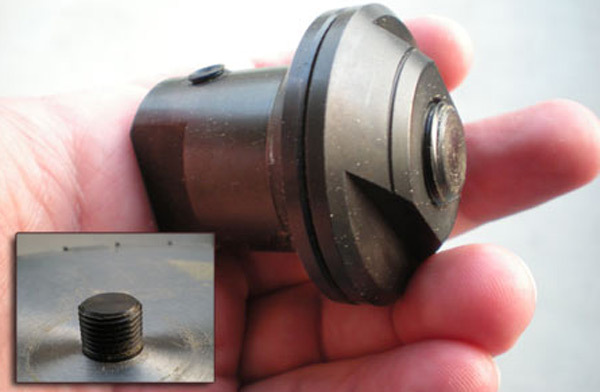 Actually, the 1.25″ arbor is not some sales gimmick, even less is it the hallmark of a “hobbyist” machine. When Shopsmith Mark V’s were first released (in 1953, and you can still get parts to fix and upgrade your 70 year-old machine today! ), 8″ saw blades were the hobbyist grade, and 10″ were for larger commercial machines. What size arbor did those larger commercial machines use for their 10″ blades? That’s right–1.25″ arbors, because engineers had found that to be the sweet spot of stability in the blade. However, HOBBYIST tool manufacturers who started jumping on the 10″ blade wagon didn’t want to re-tool all of their machines, so what did they do? They kept the 5/8″ arbor size they used on the 8″ blades. The problem was you risk wobble and run out with the smaller arbor, especially on thin-kerf saws. The 5/8″ arbors for the Shopsmith, however, are no secret and aren’t kept hidden in any way. They are a step down in quality and precision, though, from the 1.25″. You will note there are other high-end blade manufacturers who produce 1.25″ arbors on their 10″ blades, because Shopsmith is not the only machine to use them–it is, however, the only reasonably priced machine that consumers have easy access to. I just got one of these arbors and love it. Granted, they should be included standard. I got my Mark V for free from a family member, so I can’t complain. It’s 25 years old and still runs great. Good tool for my very small work space. Well, I bought a Shopsmith about a year ago. I am a woodturner with a tiny shop, and looking to save room by getting rid my craftsman contractor saw, that I use once a year. I still have a 14inch bandsaw with a riser, my midi lathe, and a 12inch benchtop drill press, but the shopsmith I bought used gets me a bandsaw for scroll work, disk sander, and larger lathe for less money than the lathe by itself. To be fair, I rarely use it as a lathe, but it gives me capacity when I need it. Mine also came with a jointer, another tool that if I had bought, I would use once a year or so. Shopsmith seems to constantly innovate, for example, they have a “conical disk sander” disk that allows thickness sanding on the shopsmith. They also have grinding wheel arbors and jigs for tool sharpening. All in one machine. the biggest downside I have seen is that if you have to change over the machine for a single cut. But, since I have my bandsaw and drill press still, those are the two operations that I end up doing “just one” of the most. You can also use the dado arbor for a blade arbor. The popularity of Shopsmith is due to several features being top-of-the-line. As a sanding station it is a excellent machine. It also offers a nice drill press option and a lathe, which although not the best is better than any low budget machine that you may not use that often. The tablesaw is a weak point , but if you know what you are doing only become somewhat of an issue when do miters that require tilting the table. #1 reason for a Shopsmith – Q U A L I T Y !!! They are built well, easy for the home user to fix and do a lot of features that a home workshop can use, but might not always do. Parts are still available for 50 year old machines and in the used market they usually aren’t too expensive. I have a Shopsmith Mk.5 (520) I bought probably 15 years ago, brand new. Still works great today, and I’m always figuring out novel applications for it. I also have a European combination machine, a Felder BF631, which I picked up used some 10 years ago. Where the Shopsmith is might be called “lathe based”.. the Felder would be a sliding tablesaw-shaper married to a combo-jointer-planer. The two complement each other quite well, and I often have both set up at the same time. They both have lots of forward-thinking safety features… when I bought the Shopsmith, they were one of the first US tool makers to include a European style riving knife. They also included some very well thought out push sticks, blocks, miter-slot feather boards, etc. Curiously, both machines have unique saw arbors. Shopsmith went with a 1.25″ arbor hole, for reasons unknown, but speculation abounds (reduce vibration? easier to remove the nut? eco-system lock-in? who knows). Shopsmith also offers a 5/8″ saw arbor for use with 3rd party blades, which I bought several of and keep permanently attached to my favorite blades. The arbors stay on the blades and one can very quickly swap blades on the 5/8″ output shaft with a simple set screw that engages a reverse tapered flat, so even if the set screw loosens, the attachment/arbor is still retained, though I’ve not had any problems. Felder uses a special arbor with two locator pins. This functions to keep the blade from slipping at all, so the arbor nut arrangement is a much more user-friendly affair for changing blades: an allen key for an inner machine locking screw, and a wrench for an outside flange/nut. Not quite as fast as changing blades on the Shopsmith, but faster and more secure than a simple lh-threaded arbor. 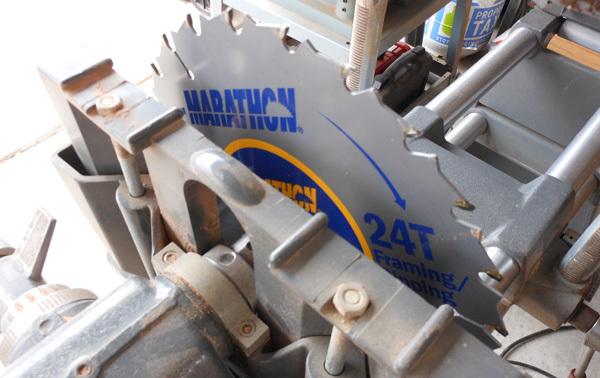 If your saw uses an unusual blade arbor, any competent saw blade company can bore the arbor hole(s) to your specifications for a nominal fee. If they’ve done it before for other customers, they won’t even have to ask you for the specifications. I’ve had Ghudo and Forrest Woodworker II blades made up for my Felder. Great blades, and I have the thin-kerf WWII on my Shopsmith, making better use of the available power. As far as Shopsmith goes, it is a great piece of equipment once you learn its pros and cons – read the manual! The trick with any tool is to make the most of the pros, mitigate the cons, and focus on the project at hand. Some tools are just plain frustrating, for example, if they don’t hold their settings, expose you to unnecessary risk due to poor design, or flimsy parts break or burn out. My Shopsmith has never frustrated me in those way, and it is often admired by visitors who have never seen anything like it (“Well, that looks incredibly handy to have! What is it?”). I don’t understand why this blog tries to make it seem that these arbors are hard to find. Google “Shopsmith saw blade arbor” and the very page this blog links to is #2 on the page. Go to shopsmith.com and the page this blog links to is #1 on the list. Is there some reason why we have to phony up a non-existent issue here? I spent over 1/2 day trying to find a 5/8″ arbor to use on 3rd party blades for my ShopSmith, which by now, people can see uses a 1.25″ normally. In addition to not being able to find one for the ShopSmith, I found today that it is near impossible to even find arbors for any table saw blades, no matter the saw brand or size! I know I can get a 5/8″ arbor from SS for about $32 (Ebay wants $55) but I was hoping to use it today (Friday, of course) rather than to wait until they ship one to me. I cannot understand stores selling saw blades but not arbors! Am I being stupid here or does that not sound like an OC (of course) situation? Possibly I am putting my ignorance on display but, unless there is something I do not know, I am wondering if opening up an arbor store wouldn’t be a good idea? 😉 Because they seem to be so far and few between (I checked all the big box stores, for hours, like Home Depot, Ace, and Menard’s etc.) opening up that store seems more and more like a good idea. They have thousands of hours of video how-to’s for using the machine for some specific function that cost me nothing to watch and use. One is also allowed to download frames from the video as well as the plans for whatever the subject matter of the video entails, if applicable – for free. Anyone can go to their site and do this. They have a video for everything their machine is capable of doing, in order to better acquaint me with the machine and the work it does. They also have more specific videos for a fee. I have never bought anything from a company that has better service after the sale as with ShopSmith. I send them an email outlining my problem and get a specific answer the next morning! Once I had such a complicated problem that they asked me to take pics and send them in for their engineers to formulate an answer with but otherwise, it is always a “next morning” turn around for my problems. The problem does not have to be with the equipment but rather for any problem I am having in doing a task or other using their machine! After looking on Ebay and Amazon, I am now simply going to order the 5/8″ arbor from SS and just do some other aspect of the job this weekend. Had I just done that this morning, I would be getting the product on Monday or Tues rather than just getting my order in on Monday and had the day to do something else. Oh well, live and learn.